Be the first to share your favorite memory, photo or story of Felton. This memorial page is dedicated for family, friends and future generations to celebrate the life of their loved one. Mr. Felton C. Williams, 85, of LaGrange, passed away Tuesday, January 22, 2019 at Wellstar West Georgia Medical Center. Mr. Williams was born April 25, 1933, in Rome, GA son of the late Henry Williams and Lois Logan Williams. One scripture that would be the sum of his life is “Love the Lord your God with all your heart, soul, mind, and strength; and love your neighbor as you love yourself.” His life was spent sharing the love and restoration power of Jesus with others. By trade he was a long-distance driver, but to those who knew him best he was the “truck-driving preacher.” His pulpit was wherever he was and he ministered to everyone that God brought across his path. Throughout the nation, truckers and churches knew him and loved him. Mr. Williams was instrumental in starting Courts of Praise Christian Center and Daycare where he served as an Elder. He was also a mentor and advisor to many pastors locally and across the nation. 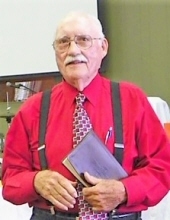 After his retirement as a truck driver, he was employed by LaFayette Christian School Early Learning Center, where he was often referred to as the daycare “PawPaw.” He was a prayer warrior and could be found walking the halls many evenings praying for the children, their parents, teachers and administrators. Every Thursday was dedicated to praying for his family, friends, churches, and our country. Survivors include his daughters and sons in-law, Debra and Philip Borders of LaGrange, Johanna and Larry McGhee of Hogansville; sons, Clay and Jennie Williams of LaGrange, Tim and Rhonda Taylor of Columbus, OH; sister and brother in-law, Helen and Jack Ramsey of Hogansville; brother, Melvin Williams of Ojai, CA; grandchildren, Chris McGhee, Julie White, Jennifer McGhee, Jeremy McGhee, Faith Duble, Leah Henck, Brian Borders, Andrea Borders, Rebecca Borders, Ryan Williams, Michael Williams, Joshua Williams, Grayson Williams; and sixteen great-grandchildren. He was preceded in death by his wife, Jean Childs Williams. The funeral service will be conducted at 11:00 a.m., Friday, January 25, at the Auditorium of LaFayette Christian School in LaGrange. Pastor Alex Montgomery, Pastor Chalton Askew and Pastor Hope Taylor will officiate and interment will be in Myrtle Hill Cemetery in Hogansville. Flowers are welcomed or memorial contributions may be made to LaFayette Christian School Early Learning Center. To send flowers or a remembrance gift to the family of Felton C. Williams, please visit our Tribute Store. "Email Address" would like to share the life celebration of Felton C. Williams. Click on the "link" to go to share a favorite memory or leave a condolence message for the family.